Over the past few months, and with the help of those serving on the Customer Advisory Boards we have completed a significant upgrade for the ReloSpec software and plan to release the new version the week of July 2nd. This upgraded Relocation Specialist (ReloSpec) version involves the Client List page as well as Action Plans, AutoPilot and other features. Beginning next week, when you login you’ll be taken to the new Client List page. This upgraded page is cleaner, better organized and easier to use. Most of the features you have been using with the ‘Classic’ version are still available and, many features such as SEARCH and EDIT (pencil) work the same. This new version is what is currently known as the ‘Mobile’ mode version. Those using the mobile version on their phones have found it much easier to use and suggested it be expanded to the desktop version. After reviewing with many current ReloSpec users we have completed the upgrades and are introducing the mobile version as the upgrade with expanded capabilities. Included with the new version is an enhanced ADD NEW page that includes a droplist to select the Action Plan (collection of predetermined Tasks) to be run. The Tasks are scheduled and any AutoPilots due to go out right away are automatically sent. Just fill-in the form with what you know, select the Action Plan and SUBMIT. The rest is done for you! To have the automatic Action Plans feature enabled, be sure #3 in the ‘Getting Ready’ section below has been completed. For a short time, those who want to use the ‘Classic’ version (the one you’re using today) may do so by checking the ‘Classic Display?’ checkbox on the Login page prior to logging in. For those who want to get a preview or want to begin using the new version, click the ‘Mobile?’ checkbox on the login page prior to clicking LOGIN. This is one of the most significant changes to ReloSpec in years. We appreciate all the many suggestions and helps we received from our wonderful ReloSpec friends and associates. Checklist to get ready for the new ReloSpec version. Many of you will already have each of these items in place and there will be nothing to do to get ready. However, to get the most out of the new version, please take a minute to be sure each of the following items are completed. Company logo Your company logo will appear on the Client List page in the upper-left corner. This logo will be included on outgoing FORMS and should be as square-shaped as possible. If it is not displayed, return to the Main Menu page, click SETTINGS, then click ‘Upload Logo’ and follow the prompts. Company name Your company name should appear in the upper-right of the Client List page. It is setup in the Users table and is used along with your Email Signature with outgoing emails. If not displayed, return to the Main Menu page, click SETTINGS, USERS, click the pencil for your name, make the needed changes and click UPDATE CURRENT RECORD. Allow pop-ups One of the newer features is the ADD NEW form. It includes a droplist for selecting the Action Plan you want to use then schedules the Tasks and sends any AutoPilots that are due to go out immediately. All with one click! For ReloSpec to schedule and send the AutoPilots your browser must allow pop-ups for ReloSpecCloud.com. Use the settings feature of your browser to make the change, if needed. 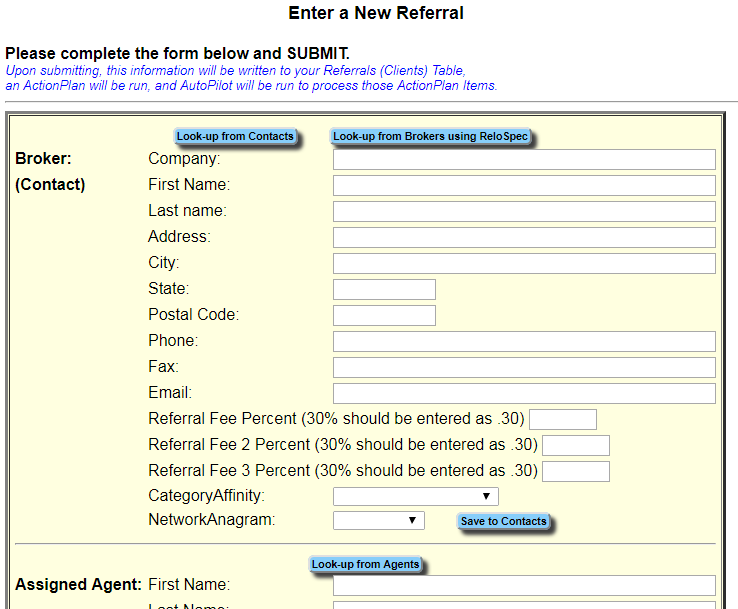 Have at least one ‘Referral Source’ When clicking the ADD NEW button to start a new referral, ReloSpec attempts to build the droplist for the Referral Source. If you don’t already have at least one entered a yellow warning box appears at the top of the page. To avoid the warning (if it appears) do the following: Return to the Main Menu page, click SETTINGS, click ‘Referral Sources’ and enter “sample” and click ADD NEW RECORD. Do I have to download anything to use the new version? No. Since ReloSpec is web-based, just login and you’ll have the latest version. Can I still use the old (Classic) version? Yes. For a limited time the classic version will remain available. From the Main Menu page click the checkbox for ‘Classic Display?’ and you’ll use the classic version. Where are the links that were on the left side of the page? The links have been moved to either the top of the page or are included in the ‘Other Options’ droplist. Can I edit fields not included in the ADD NEW page? Yes. After adding a new record it will appear in the Client List page. Click the pencil to edit any of the fields. Are the Notes and Tasks still displayed below the grid? Yes. The grid now contains a maximum of 10 records and the Notes and Tasks are still displayed below the grid for the selected record. What does the ‘Quick’ button do? Once you have selected a record in the AutoPilot, the Responses or the Tickler page, minimize the page and click the ‘Quick’ button to instantly select the corresponding record. Say you’re looking at an AutoPilot item and you want to see the Notes for that record. Click the ‘Quick’ button and view the one record with the Notes displayed below the grid. Quick and easy! Click ‘Cancel Quick’ to return to the normal display. What does the Action Plan droplist do in the ADD NEW page? By selecting the Action Plan in the droplist, when you click SUBMIT, the Action Plan Items are scheduled and any AutoPilots that are due will be sent. All with one click. If you complete the form are not ready to select an Action Plan, click the droplist and select the blank area before clicking SUBMIT. The record will be saved but no Action Plan will be run. Can I run an Action Plan on an existing record? At any time you can select the record in the Client List page, click the ‘Action Plans’ button to open the page, select the one you want and click the button to schedule the Items. Will there be more upgrades coming? Yes. Many new features are planned for ReloSpec. Menu bars will be added plus the ability to view all details (ie. Notes, Tasks, Closing Info) in accordion style in the Client List page. Integration with other services such as websites and other software as well as simplified forms and reports are in the planning stages now. Many ReloSpec users have used the ‘Mobile’ mode to view/edit records on their phone. Thanks to suggestions from members of our Customer Advisory Boards we have greatly enhanced the ‘Mobile’ mode which may now be used on your phone or desktop. The enhanced Mobile mode is the first step towards the ReloSpec ‘face lift’ planned for this page later this year. The whole idea is to make things simpler and more efficient. It all begins with the checkbox for ‘Mobile?’ when logging in. If you access the login page on your phone, ReloSpec will recognize you’re using a phone and will default to ‘Mobile mode’. Using your desktop when you login, click the checkbox next to ‘Mobile?’ then click the ‘Log In’ button. After a brief (1 second) delay you will be automatically taken to the Mobile version of the Client List page. The ‘Mobile’ page contains most of the features of the ‘Classic’ version but is cleaner looking and less confusing to new users. Clicking ‘Add New’ will open the newer ‘Express’ form which includes the Action Plan choices in the droplist at the bottom of the page. Using this form will insert the new record, schedule the Action Plan items and send the AutoPilot(s) with just one click! The AutoPilots, Responses and Import buttons display the total number of each. If any of the buttons is > 0 you’ll know to click the button and process the records. The grid shows the most popular fields, and includes the envelopes by each name allowing you to quickly send an email as needed. We hope you enjoy using the upgraded Mobile version. And remember, it’s not just for use on your phone! As we stated in the April 5th blog we are in the process of upgrading our ReloSpec email services. Now that the groundwork is complete we are applying the upgrade to the first set of email pages which include those generated by clicking the envelope icons on the Client List page. This week we’ll begin applying the changes to the popular ReloSpec forms including AutoPilot, AutoUpdate, AutoAssign, Referral Submit and others. All upgraded emails will include your Company Name which will be inserted in front of the FROM: email address which is notify@relosoftware.com. That way your recipients will know who it is coming from. For example, if the email is coming from Susie at ABC Realty the FROM: will have “ABC Realty <notify@relosoftware.com>”. What will display in the Inbox is just “ABC Realty”. In ALL cases when the recipient clicks REPLY, the sender’s exact email address will be inserted automatically. So, even though the FROM: is “ABC Realty <notify@relosoftware.com>”, when the person clicks REPLY: the TO: field will have something like “Susie@ABCRealty.com” -just as it has always worked. Since we’ll be inserting the Company Name in the FROM: field, some may want to shorten what will appear. This is not required, but is suggested. For those customers affiliated with Berkshire Hathaway HomeServices [My Company Name] this may be especially true. Changes may be made in the SETTINGS, USERS table. Remember that you may also add language to the SUBJECT line, such as “Hello from Susie at ABC Realty”. That may help if you want your email recipients to have additional info. IMPORTANT: For now, DO NOT include more than one email address at a time in the same field. You may have one email address in the TO: field and one email address in the CC: field and one in the BCC: field, but for now having more than one in any of the fields will prevent the email from being delivered. This will change in the next couple weeks, but for now just include one email address in each field. We all know that spam is a fact of life on the internet, and while major email service providers have made enormous strides over the years in identifying those unsolicited messages from your long lost aunt who is stranded on a Pacific island and needs funding to get home, some of those filters can be very aggressive, leading to delivery problems for legitimate e-mail messages. ReloSpec Cloud is no exception when it comes to the possibility of delivery issues. One of the ways applications maximize the chance for successful delivery of a message is to make use of what’s called an authenticated domain, where, essentially, the “server is known to match the sender”. This is an industry best practice, and ReloSpec Cloud now has a way to honor this best practice by partnering with Mailgun, a reputable and well-regarded, enterprise-strength e-mail service. The authenticated domain we’ll be using is relosoftware.com. What does this mean for you? Really, it’s not that big a deal, but there are a couple things you should be aware of. Whether you use Outlook, Gmail, or a different mail client, messages coming from ReloSpec Cloud will be coming from notify@relosoftware.com. It will probably look a bit like what you see here. What this means is that any rules you have set in your inbox that reference a previous “from” address will no longer be in effect. You might wish to reset such rules. Aside from that, nothing changes. When you hit “Reply” to one of these messages, your email client will recognize the “Reply-To” in the incoming message. This is the address of the person that actually sent you the message. You can reply as usual be on your way. The conversion to this new method will begin the week of April 9th and continue through May 1st. The benefits we can all expect to see: improved rate of delivery, and much more insight into what delivery problems do exist, if any. Please let us know if you have questions or concerns. We will keep you updated! Response to the web seminars has been great! We appreciate those who were able to invest a few minutes to sharpen their ReloSpec skills. However, many were not able to attend and have requested having a recorded version of the webinar available for viewing at any time. We’re happy to announce that we have added the ‘ReloSpec Checkup’ webinar as the first item on the list of pre-recorded webinars. To view the webinar, click the link on the Main Menu page for Web Seminar Schedule. Scroll to the bottom of the page and click the link for the ‘ReloSpec Checkup’. Or, click here for a quicker way to view it.